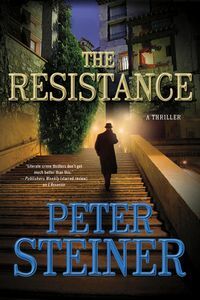 The Resistance by Peter Steiner, a Mysterious Review. Review: Louis Morgon's life was the CIA, winning awards and commendations for his work. But now he is without a job, fired for incompetence. Thirty-five years old, he's young enough to start something else, but after attempts at teaching and writing he's at a loss. Heeding the advice of his ex-wife to start over in a new place, he travels to France, where he discovers the charming village of Saint-Leon-sur-Dême. Buying an old house in desperate need of repair, he sets about making a new home for himself. While working in the kitchen replacing tiles, the floor gives way to the crawlspace below, where he finds an old wooden box containing six loaded pistols, a container of ammunition, and a stack of papers that appear to be handbills. Obviously decades old, the printing had faded to the point of being nearly illegible, but he can make out a few names, one of which is the same as the current constable of the village, Jean Renard. Intrigued, he sets out to learn more about his find in The Resistance, the fourth mystery in this series by Peter Steiner, but set earlier in time than the previous books. In May of 1940 the Germans began occupying France. Inevitably towns became divided over the action, some residents siding with the Germans as collaborators, others — often neighbors — resisting their presence. The latter adopted red Vs and Lorraine crosses as their symbols of resistance, painting the town with them. And then the handbills started, the first simply titled "Liberation … Issue 1 … January 12, 1941". The writer told of news from Germany, Russia, and other parts of France, where the Germans were rounding up Gypsies and Jews and anyone else who disobeyed German authority. No one would admit to distributing, let alone writing the handbill, even after twenty men and women were taken into custody, five of them killed. The handbills continued to appear until June 4, 1944, when the last "Liberation" was written, giving the news that the invincible Third Reich was falling to the Allies. The Resistance is a superb historical thriller, told mostly from the perspective of the people of Saint-Leon of the 1940s. Louis Morgon actually plays a relatively small role here, but it is a clever way of developing the storyline. The identity of the "Liberation" writer remains a mystery right up to the very end, but this book should be enjoyed for more than just the mystery, also for the strong characters and their range of emotions: love and hate, violence and forgiveness. It is a time of history that many would like to forget, but it is a time of history that needs to be remembered. Special thanks to guest reviewer Betty of The Betz Review for contributing her review of The Resistance. Acknowledgment: Minotaur Books provided a copy of The Resistance for this review.